Place eight 5-ounce ramekins in a large roasting pan. In a medium saucepan, combine cream and 1/4 cup of sugar in the pan. Add vanilla extract and gently heat the cream until it just starts to bubble around the edges. Use caution to ensure the cream does not boil. While cream mixture is heating, whisk the egg yolks in a large mixing bowl with the remaining 1/2 cup of sugar and salt. After the cream has started to bubble, use a ladle to pour a small amount of the hot cream mixture into the egg mixture; whisk to combine. Gradually, ladle more of the cream mixture into the egg mixture, whisking constantly, until all the cream mixture has been combined with the egg mixture. Divide custard evenly among baking dishes and place pan in the oven. Add boiling water to the roasting pan; the water should come halfway up the sides of the dishes. Bake until custards are just set, 30 to 40 minutes (custard should tremble slightly in the center when shaken). When set, carefully remove pan from oven and gently remove baking dishes from the water bath. Place dishes on a wire rack and allow to cool for about 30 minutes. Cover the dishes with plastic wrap and chill in the refrigerator for at least 2 hours before serving. When ready to serve, caramelize the custard by coating the top with raw sugar, about 1 1/2 tablespoons for each baking dish. Using the flame of a torch, caramelize the sugar by passing the flame in a circular motion 1 to 20 inches above the surface of the custard until the sugar bubbles and turns amber. Be careful not to burn the sugar. Caramelize one dish at a time. 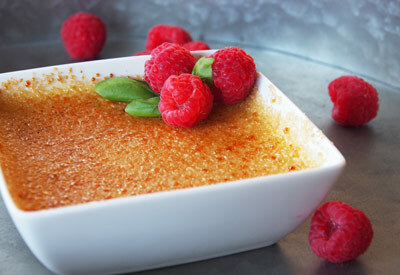 Serve immediately with fresh raspberries and mint garnish.